Microbes of the World Blog - Leprosy Triumphs Again! Congratulations Leprosy! 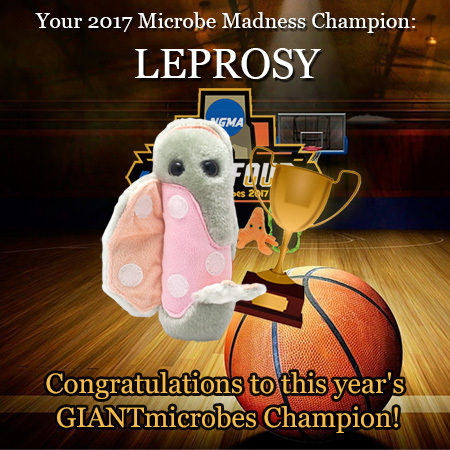 In a terrifying tournament triumph, Leprosy has been declared the winner of March Microbe Madness. Your votes determined Leprosy’s decisive wins in rounds 1 through 4 over Sleeping Sickness, Norovirus, Typhoid Fever and Food Poisoning. And in the most exciting championship since 1350 BC (when Smallpox beat Flu in the final on the Nile), Leprosy just squeaked out a win against Stem Cell 50.3% to 49.7% in the 2017 championship game. Centuries ago leprosy dominated repeatedly with horrible epidemics spread across Europe and Asia. Among the oldest of human plagues, this bacterial illness is extremely hard to catch. Leprosy is only infectious in its early stages and only certain people are vulnerable; most of us carry leprosy antibodies and are immune to it. Like tuberculosis (TB), leprosy is likely spread in coughed or sneezed droplets, and then it progresses very slowly. But if not treated with antibiotics, leprosy can severely distort the face, damage nerves and cause bodily mutilation. Medieval lepers were outcasts and carried bells or clappers to warn villagers of their approach. Leprosy began to disappear after the ravages of the Black Death in the Middle Ages. But even today leprosy affects millions of people in India, Brazil and other developing countries. The US actually sees about 100 cases each year! So we must congratulate this masterful microbe for its success in tormenting humanity for millennia and for its surprising victory in this year’s March Microbe Madness!